Safely store, charge, and transport up to five tablet devices from room to room! The Tech Tub from Copernicus is the ideal storage solution for teachers needing to easily transport a small number of tablet devices from room to room. Device inserts accommodate 5 tablets, 7 tablets, or 5 Chromebooks, and the included six- or seven-outlet powerbar charges the devices when not in use. Internal cord routing slots make it easy to keep cords neat and organized. 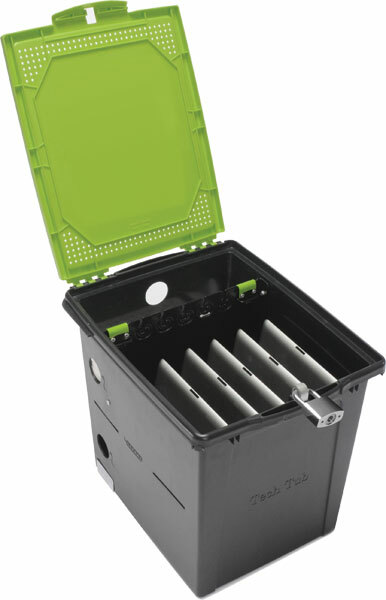 Lid locks shut with provided padlock, and locking block and pin on the bottom of the Tech Tub lets you secure it to a countertop or AV cart (an additional padlock is provided for this as well). Additional cord management includes a rear grommet hole, rear cord winder, and velcro ties. Made from highly durable, heat resistant ABS plastic, the Tech Tub also features ventilation holes to ensure proper airflow and prevent device overheating. An optional 7-outlet USB sync hub is available to sync the devices to a computer.